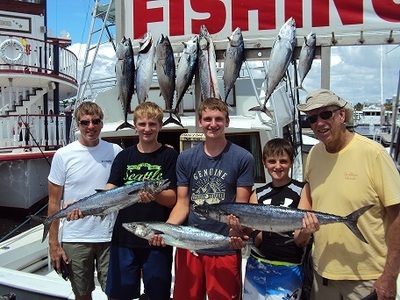 Three generations of Hooper anglers - Tom C., the grandfather, Tom P, the son, and Tom's three boys � Colby, Marshal and Grant � from Ohio chartered the Top Shot Sportfishing charter boat team to do some deep sea charter boat sport fishing in Fort Lauderdale, FL. As the Hooper's were greeted by the Top Shot Sportfishing team, I asked them what type of fishing they were interested in. They replied � any type of fishing � they just want to see some action. Fifteen minutes after leaving the Bahia Mar dock, lines were in 120 ft. of water at the sea buoy in Fort Lauderdale, 1.8 miles off shore. If you venture off another � of a mile, you will find yourself in 500 ft. of water due to our extreme drop off. We started out trolling with two #8 plainers down, one with a 3 � blue reflector drone spoon and the other with a chartreuse sea witch in front of a double hooked Ballyhoo. For surface baits, we went with two Ballyhoos and two Bonito strips. We trolled the reefs, zig zagging in and out between 75 ft. of water out to 210 ft., and trolling over some of our 34 artificial wrecks in Fort Lauderdale. These wrecks consist of small vessels up to large freighters � 550 ft. in length. These artificial wrecks will hold the bait fish and in return the predators are not too far behind. You can find these wrecks located on GPS maps. All the anglers took turns reeling in their catches and wound up with eight Kingfish, six Bonitos and three Barrucadas � the Hoopers got their wish � an action packed fishing charter. The anglers retired into the a/c salon and enjoyed the relaxing trip back to the dock at Bahia Bar Yachting Center, 801 Seabreeze Blvd. Fort Lauderdale 33316. Dave, our mate, filet out the fish which will be cooked and eaten later.